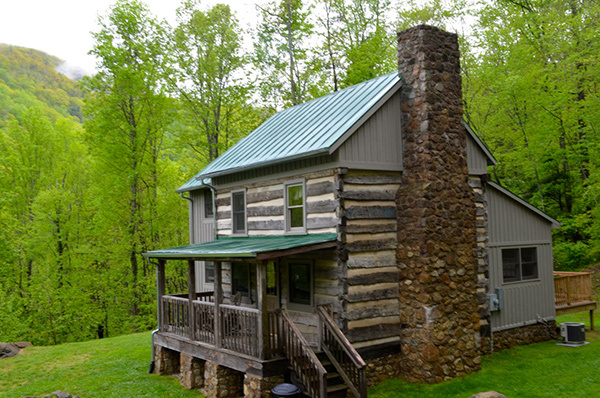 The Cabins at Crabtree Falls offers 5 different accommodations. All cabins offer outdoor fire pits, full bathrooms, full kitchens, heating and air conditioning and televisions (2 with satellite and the rest with DVD players). We supply all kitchen and dining necessities, small toiletries and all bedding and towels. Annie’s Cabin is an 1800’s antique log cabin and sleeps 5. Jack’s Place is a contemporary mountain cottage and sleeps 6. Tony’s Place is duplex-style and sleeps 2. Barb’s House is a large mountain cottage with three separate sleeping areas, sleeps 6 and is more secluded than the previously mentioned cabins. Richard’s Retreat is the largest and newest cabin, originally an antique log cabin with a modern addition of two large sleeping areas, a large and beautiful kitchen, two full bathrooms, an indoor fireplace and an outdoor hot tub and sleeps 8 comfortably. Each cabin varies in price with daily and weekly rates available. The property is located above the Tye River, one quarter mile from Crabtree Falls. Pet-friendly (all cabins except for Richard’s Retreat).